Scientific journal „Meat Technology“ from 1960. that publishes results of basic and applied research in the field of biotechnical sciences i.e. the following subcategories: veterinary sciences, food engineering and biotecnology. „Meat Technology“ is published two times per a year. Founder and publisher is Institute of meat hygiene and technology. 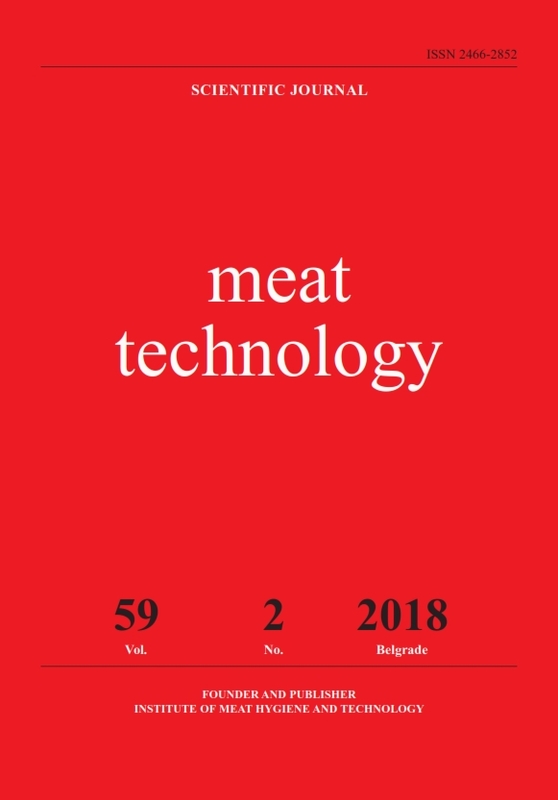 „Meat Technology“ is an open access journal. All articles can be downloaded free and used in accordance with Cretaive Commons Attribution 4.0 International (CC BY 4.0). There is no publication fee for electronic version of journal. Also, there is no submission fee. The Ministry of Science and Technological Development of the Republic of Serbia (no. 413-00-00461/2000-01) has defined this publication as of special scientific interest. According to the Categorization of the scietific journals in year 2017, issued by Ministry of education, science and technological development, Meat Technology is categorized as National journal of international importance M24.